Beautiful Bellasera Real Estate community is located in far Northern Scottsdale, in the Sonoran Desert, one of the most beautiful deserts in the world. Nestled up against Lone Mountain, the community's major crossroads are Scottsdale Rd. to the West and Lone Mountain Rd. to the North. 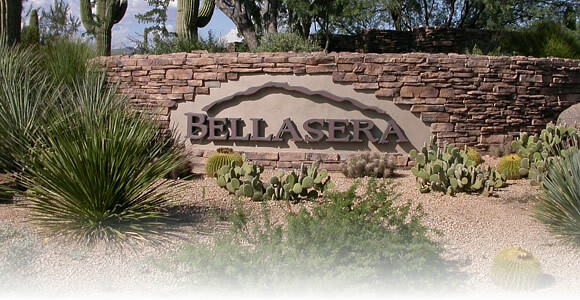 Bellasera Real Estate is an intimate community in north Scottsdale developed by Del Webb. Bellasera has 360 homes on 290 acres of land alongside Lone Mountain . There are ten different home plans ranging in size from 2136 to 4142 square feet. Many homes back up to natural washes due to the developers devoting 40% of its land to preserving the wild and unspoiled desert. . This resort-like community offers a health club and fitness center with separate men's and women's steam rooms. There are three lighted tennis courts and a swimming pool that makes a perfect backdrop for a party. The Bellasera Real Estate development is one of the finest Scottsdale's AZ Real Estate communities. The name "Bellasera" draws on features of the natural environment to embrace a sense of the community that will come to be. Striking rock formations and an endless expanse of sky convey an almost old-world romance reminiscent of mountains in Portugal. In Portuguese, the words "bella" and "sera" come together to create "summit of beauty," a fitting explanation for life on this higher plane. When you decide to buy Scottsdale AZ Real Estate, (whether it's Bellasera Real Estate or some other premium Scottsdale AZ Real estate) be prepared to live amidst some of the most renowned luxury resorts and spas, championship golf courses, gorgeous homes, and natural desert beauty in the world. With all these amenities at your fingertips you’ll be living in paradise.